In 2009 Tallaght Stadium became the latest home to League of Ireland side, Shamrock Rovers. Following almost 22 years of a nomadic existence Rovers finally came to rest at the Tallaght Stadium in March 2009. The stadium was completed, and is owned, by South Dublin County Council. Located in the Sean Walsh Memorial Park, off Whitestown Way, the football ground was officially opened by Martin Cullen T.D. and Minister for Sport, Arts & Tourism on 27th May 2009. The stadium comprises two all-seater stands, East & West, and can accommodate 6,500 fans on competitive match days. 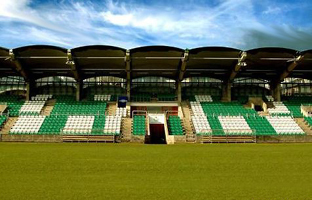 For friendly football matches the capacity of Tallaght Stadium can be expanded to 10,000 through the addition of temporary seating at the Square shopping centre side of the ground. Following the sale of Glenmalure Park by owner Louis Kilcoyne in 1987 Shamrock Rovers spent the next 22 years playing their home matches in a variety of football grounds and venues. This was a huge shock to the system for most loyal Rovers fans as Glenmalure Park had been the club's home for over 60 years. The fact that Glenmalure was sold to property developers and that no permanent replacement ground had been provide for the club rankled with the supporters. 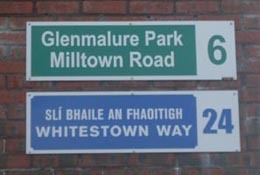 In the period between the exodus from Glenmalure Park to the arrival at promised land that was Tallaght Stadium, Shamrock Rovers home football grounds included, Tolka Park, Dalymount Park, the RDS, Morton Stadium, and Richmond Park. Shamrock Rovers Football Club was acquired by Premier Computers, fronted by Alan McGrath, in 1996 who promptly announced ambitious plans to build an fully seated stadium in Tallaght with capacity of 10,000. Following a very protracted planning phase, which included objections from local residents, work on Tallaght Stadium began on a site in the Sean Walsh Memorial Park at Whitestown Way. The site and the planning permission had been granted by South Dublin County Council (SDCC). Construction work on Shamrock Rover's new stadium began in October 2000. Rovers ran into financial difficulties and eventually had to concede that the club did not have the resources to complete the stadium. For a number of years the half-built stadium stood idle until the SDCC came up with plan to complete the construction of the stadium and to grant Shamrock Rovers attractive lease terms. Unfortunately the long-suffering and much-travelled Rovers fans were made to wait further due to legal wrangling between South Dublin County Council and local GAA club Thomas Davis, who were seeking use of Tallaght Stadium for some of its' home matches. Eventually the law courts ruled against the Thomas Davis club and construction work recommenced on the stadium. After thirteen years from the announcement of the plans for the Tallaght Stadium Shamrock Rovers FC played it's first home match in Tallaght in March 2009. Shamrock Rovers Team : Barry Murphy, Simon Madden, Ian Bermingham, Aidan Price, Sean Webb, Shane Robinson (capt), Stephen Rice, Gary Twigg (Greg Cameron 89 mins), Stephen Bradley (Eoin Doyle 82 mins), Ollie Cahill, Dessie Baker (Tadhg Purcell 74 mins). Substitutes not used: Corie Treacy, Robert Duggan. Sligo Rovers Team : Richard Brush, Jason Noctor (Paul McTiernan 79 mins), Shaun Holmes, Danny Ventre, Gavin Peers, Conor O'Grady, Brian Cash (Stephen Parkhouse 57 mins), Richie Ryan (Eoin Torpey 57 mins), Romuald Boco, Rafael Cretaro, Owen Morrison. Substitutes not used: Steve Feeney, Ciaran Kelly. On the 20th July 2009 Spanish soccer giants Real Madrid played against Shamrock Rovers in Tallaght Stadium. It was a friendly match that formed part of Real Madrid's pre-season preparation. Sports management company, Platinum One arranged for the Spanish giants to stay and train at Carton House in Maynooth, County Kildare and to play the match in Tallaght Stadium. The Real Madrid squad included world record signing Ronaldo, who had recently signed from Manchester United for a €92m. The Spanish squad also included other world class players such as, Raul, Karim Benzema, and Gabriel Heinze. Ronaldo's debut against Shamrock Rovers was very exciting for the 10,000 fans present on the night however the fans had to content themselves with a single late goal by Benzema which secured a one-nil victory for Real over over a spirited Rovers selection. 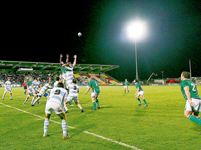 Tallaght Stadium was also the venue for another first - an international rugby match in Tallaght. On Friday, 27th November 2009, the Ireland A team took on the Argentinean Jaguares. On a cold night the Irish comprehensively defeated the visiting Argentina A team by a scoreline of 31-0. Ulster's Ryan Caldwell scored the first rugby points ever scored in the Tallaght Stadium when he touched down for a try after twelve minutes in front of an attendance of just over 4,000. Tallaght Stadium is situated in the Sean Walsh Memorial Park, Whitestown Way (off the N81), Tallaght, Dublin 24. The stadium is served by a number of buses and is within walking distance of the Tallaght LUAS terminus (Red Line). There is car parking available at the stadium for 500 cars however on match days parking is only allocated to pass holders. The Square shopping centre car park, which is situated approximately three hundred yards from the ground, charges modest parking fees.